Russia’s Jenna Cordonnier sends the ball over the net during a Division III district final against Riverside on Oct. 28, 2017. Cordonnier is one of four returning starters for the Raiders, which are looking for consecutive district titles for the first time since 1975-76. RUSSIA — Forty two years have passed since the Russia Raiders high school volleyball team played in consecutive regional tournaments. Led by four standout seniors, the Raiders are confident in their ability to get there again following last year’s appearance. The biggest hurdle? Teams like Anna, Fort Loramie and Jackson Center have the same idea. And that’s not even including the state powers from the Midwest Athletic Conference. Welcome to volleyball in the Division IV Southwest regional. Russia’s regional has produced the last 11 state champions and 13 of the past 14 with defending champion New Bremen, Marion Local (5 titles), Jackson Center (2) and Fort Loramie, Lehman Catholic and St. Henry. Still, with a talented core returning and tournament experience from last season the Raiders ask why not us? Russia went 19-8 overall last season and finished tied for second in the Shelby County Athletic League at 9-3. The season came to an end against Fort Loramie in the regional semifinals with a four-set loss of 18-25, 20-25, 26-24, 24-26. Another strong run this season gives Russia consecutive trips to the regional tournament for the first time since 1975-76. Middle hitter Laurissa Poling, setter Jenna Cordonnier, outside hitter/defensive specialist Morgan Wenrick and middle hitter Samantha Gaerke return as senior leaders for the Raiders. 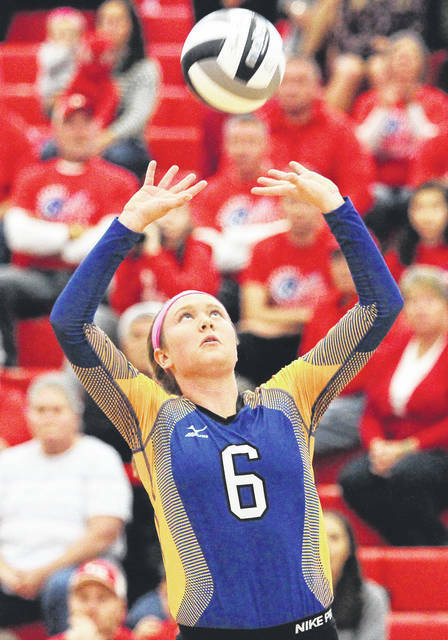 Poling holds the school record for kills in a match with 26 (set against Jackson Center) and has the potential to break the program’s single-season record of 332. She’s within reach of the career record for kills of 858 held by Kylie Wilson and enters the season 297 shy. Poling is also 44 blocks shy of the career record of 252 held by Claire Sherman. Last season she led the team with 321 kills and 100 blocks. Cordonnier accounted for a team-high 714 assists last season and ranked second in aces (44), blocks (37) and digs (27). Her assists set the single-season record, breaking the previous best of 713 held by Kristin Drees. Wenrick recorded 112 kills and 87 digs, while Gaerke takes on a larger role this season. “Morgan and Sam have been great senior leaders to this point,” Watkins said. “Morgan will be a three-year starter and Sam has worked hard to be able to contribute this season. Looking for big things out of them this year for us to reach our goals. Russia reached the regional semifinals in a Region 16 bracket that also included New Bremen, Fort Loramie and Jackson Center. Russia split with Fort Loramie during the regular season and gave the Redskins a tough-four set match. Fort Loramie then lost to New Bremen in four sets. This season, it could be the Russia Raiders. This entry was tagged Aaron Watkins, high school, high school fall preview 2018, Jenna Cordonnier, Laurissa Poling, Morgan Wenrick, ohio, prep, preview, Raiders, Russia, Russia Ohio, Samantha Gaerke, SCAL, season preview, Shelby County Athletic League, Volleyball. Bookmark the permalink.